Lydia Alberta Hansen obituary. Carnes Funeral Home. Lydia Alberta “Mickey” Hansen of Huntsville passed away peacefully and surrounded by family on Sept 8th 2017. Mickey was born on Oct 1st, 1940 in Houston, TX to Leslie Joseph Winslow and Irene Polk Winslow. She grew up in Magnolia, TX. Anyone that knew Mickey, knew of her love of horses. 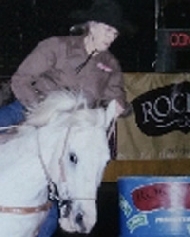 She began riding at an early age and performing in rodeos by the age of four. At 14, she won the National High School “All Around” Champion Cowgirl and was even featured in Sports Illustrated. Her goal was to be a professional barrel racer. She competed all across the United States and held the Arena Record at the Forth Worth Stock Show for many years. Her passion and love of the rodeo carried her through a 70 year career. She loved spending time with her family and telling her stories. She will truly be missed by our family and her barrel racing family as well. She is survived by her daughters, Glenda Hansen and Pam Hansen. Her two grandchildren, Robby Russo and Mickey Lynn Hansen. Her great grandchildren, James, Troy, Travis, Kinley and Mason. Her sister, Winona “Sissy” Fuchs of Navasota. . Her nieces, Sheilah Prihoda, Joy Lynn Smith and Tonya Jolly. Several great nieces and nephews. She was preceded in death by her parents and siblings, Opal Rice, Joy Lee Winters and Leslie “Bubba” Winslow. The family would like to thank her great niece, Sabrina Herrell and Nurse Karen with Heart to Heart Hospice Care for all of their care and dedication.